How often do we hear about electrical accidents resulting in grave injuries, even death of people? And in most cases, these accidents are caused by the malfunction of the power cables. But such calamities can be avoided if you use the XLPE Insulated Power Cables. Manufactured by the universally trusted electrical products brand V-Guard, these XLPE Insulated Power Cables provides 100% conductivity of power while ensuring 100% safety against any type of power cable malfunction. The conductor used in these power cables are either copper or aluminum. These power cables are available in both armored and unarmored variants. The safety level of these power cables can be ascertained by the fact that the application standards of these power cables are IS: 7098 (Part 1). These power cables consist of the conductor, the insulation, PVC Tape or extruded bedding, the armor and the outer sheathing. The range of the single core XLPE Insulated Power Cables is up to 1000 Square Millimeters, whereas the range of the multi core XLPE Insulated Power Cables varies from 4 Square Millimeters to 400 Square Millimeters. 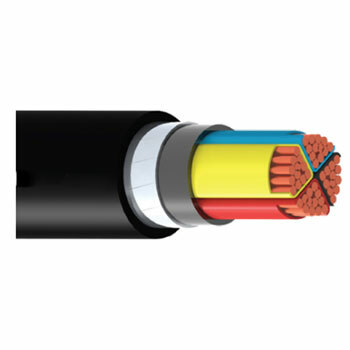 There are also the 3.5 core XLPE Insulated Power Cables, whose range varies from 25 Square Millimeters to 400 Square Millimeters.